MSN Messenger, later rebranded as Windows Live Messenger, was a cross-platform instant messaging client developed by Microsoft. It connected to the Microsoft Messenger service while also having (as of the final version) compatibility with Yahoo! Messenger and Facebook Messenger. The client was first released as MSN Messenger Service on July 22, 1999, and was marketed under the MSN branding until 2005 when it was rebranded under Windows Live and has since been officially known by its present name, although its previous name was still used colloquially by most of its users. In June 2009, Microsoft reported the service attracted over 330 million active users each month, placing Messenger among the most widely used instant messaging clients in the world. Versions of MSN/Windows Live Messenger were released for Windows, Xbox 360, Mac OS X (later under the name Microsoft Messenger for Mac), BlackBerry OS, iOS, Java ME, S60 on Symbian OS 9.x, Zune HD, Windows Phone, Windows Mobile and Windows CE. Before the product was renamed Windows Live Messenger, it was named "MSN Messenger" from 1999 to 2006. During that time, Microsoft released seven major versions as follows. 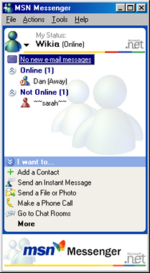 The first version of MSN Messenger Service, version 1.0 (1.0.0863), was released July 22, 1999. It included only basic features, such as plain text messaging and a simplistic contact list. When it was first released, it featured support for access to America Online's AIM network. America Online continually tried to block Microsoft from having access to their service until eventually the feature was removed, and it has not re-surfaced in any later versions of the software. AOL did this by exploiting a buffer overflow bug in AIM, which causes it to execute a bit of machine code sent by the server. When this code runs, it determines if the client is AIM and sends a message back to verify the client. Since then, the software has only allowed connections to its own service, requiring a Windows Live ID (.NET Passport at that time) account to connect. Microsoft released the first major update, version 2.0 (2.0.0083), on November 16, 1999. It included a rotating advertising banner and the ability to customize the appearance of the chat window. It came as an install option for Windows Me. This version was followed the next year by version 3.0 (3.0.0080), which was released May 29, 2000. It included file transfers and PC-to-PC and PC-to-phone audio capabilities with Net2Phone and Callserve, two of the larger VoIP providers. Along with the release of Windows XP came version 4.6 of MSN Messenger, on October 23, 2001. It included major changes to the user interface, the ability to group contacts, and support for voice conversations. 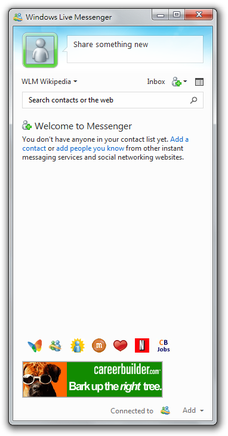 In this version, the client software was renamed from "MSN Messenger Service" to just "MSN Messenger," while the underlying service became known as ".NET Messenger Service". This version was only compatible with Windows 95, 98, ME, NT 4.0, and 2000, because Microsoft provided a scaled-down new program for Windows XP, called Windows Messenger. Version 5.0 of MSN Messenger was released on October 24, 2002. It was the first version that was allowed to be installed along with Windows Messenger on Windows XP. It included UPnP (Universal Plug and Play) based file transfers, minor changes to the user interface artwork, and a Windows Media Player interface plug-in. Version 6.0 of MSN Messenger was released July 17, 2003. MSN Messenger 6.0 was a major overhaul of the whole platform, upgrading its simple text-based interface to include customizable elements such as emoticons, personalized avatars, and backgrounds. An update, version 6.1, focused on improvements to the conversation window, enabling users to hide the window frame and menu bar, and also the ability to change the theme color. The theme color could be set differently for each user. Another update, version 6.2, was released April 22, 2004, and it was the last version of the MSN Messenger 6 series. The most notable changes were a dedicated Mobile group for mobile contacts, a connection troubleshooter, and the Launch Site feature was renamed to Fun & Games. MSN Messenger received a major upgrade to version 7.0 on April 7, 2005. This version brought wink features that were previously only available in threedegrees. This version also advertised items to sell to you including animated display pictures, emoticons and backgrounds. 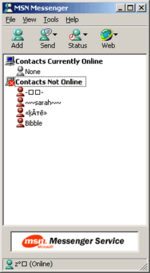 The contact list window style was also updated to match instant message windows. This version also introduced the Xbox Live Integration feature. This version also introduced digital ink and handwriting recognition support. It is the last version of MSN Messenger to support Windows 98, Windows Me and Windows 2000. The last version of MSN Messenger before the name change, version 7.5, was released August 23, 2005. New features included the Dynamic Backgrounds feature and the "msnim" protocol handler, which allowed Web sites to provide links which automatically add a contact or start conversations. Additionally, a new Voice Clips feature allowed users to hold down F2 and record a message for a maximum of 15 seconds and send it to the recipient. The window for conversations was changed slightly with an added video button. This version also introduced the Windows Installer for its auto-update feature. As part of Microsoft's Windows Live effort, which rebranded many existing MSN services and programs, MSN Messenger was renamed "Windows Live Messenger" beginning with version 8.0. The first beta of the newly renamed Windows Live Messenger, Beta 1, was released on December 13, 2005. Major changes and additions included offline messaging, an option to change the color theme of the windows, separated send and search boxes, a word wheel search box in the main window, and additional details for contacts when hovering over their names in the contact list window. The second beta of version 8.0, Beta 2, was released on February 26, 2006. The overall theme of this version was improved, fixing and improving several smaller places in the program. 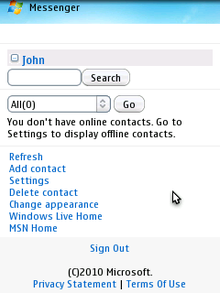 Major changes and additions included the introduction of Windows Live Contacts, the reintroduction of single file transfer, improvements to the "Add a Contact" dialog box, improved color themes, minor changes in the conversation window, and revert of the "Busy" status icon back to the normal dash icon. The final beta version, Beta 3, was released on May 2, 2006. Major changes and additions included new icons for the program, PC-to-phone calling, an updated look for the Windows Live Call window, a new default display picture, the Windows Live Today window, improvements to the grouping of sequential messages from each contact, Rhapsody integration in the U.S., and an option for sounds to be edited and/or turned off. The official release of Windows Live Messenger version 8.0 was on June 19, 2006. Although no notable changes were made between Beta 3 and the final version, the change from MSN Messenger to Windows Live Messenger brought some additional changes, such as customization for the nicknames of individual contacts, timestamps on messages, the ability to see a contact's name only once if the same person writes multiple messages in a row, and color schemes for the entire application. The main authentication system, Microsoft Passport Network, was replaced with Windows Live ID at the same time. A refresh to version 8.0 was released on August 10, 2006. It included audio and video improvements and fixed up minor bugs. A minor update, the Windows Live Messenger 8.1 Beta 1 Refresh, was released on December 13, 2006, and fixed bugs that were causing some people to be unable to sign in and others unable to see their contact list. The final version 8.1 was released on January 29, 2007. No changes were made from the Beta 1 Refresh. All versions of Windows Live Messenger below version 8.1 were rendered obsolete on September 12, 2007, due to a security issue identified when a user accepts a webcam or video chat invitation from an attacker. On September 12, 2007, the Windows Live Messenger blog posted a fix that resolved a security problem. It reported of a security vulnerability in versions of Messenger older than 8.1, that the released fix would resolve. This led to an auto-update being released to all older versions. Versions running on Windows 2000 and below were required to update to a new version of MSN Messenger 7.0, and versions running on Windows XP and above were required to update to Windows Live Messenger 8.1. On August 27, 2009, the Windows Live Messenger blog posted that due to a security problem, all users of versions 8.1 and newer need to update to the latest version, 14.0.8089. The mandatory upgrade requirement would be fully phased in by late October 2009 and began on September 15, 2009. The first beta of Windows Live Messenger 8.5, Beta 1, was released on May 31, 2007. An update was released on June 21, 2007, to test updates being installed by Microsoft Update. This version required Windows XP SP2, compared to previous versions requiring Windows XP SP1. It was the first version to be installed in a "Windows Live" folder under "Program Files," with the shortcuts placed in a "Windows Live" folder in the Start Menu. Major changes and additions in Beta 1 included a new installation program in conjunction with the release of Windows Live 2.0, a new look for all of its windows that matches the aesthetic styles of Windows Vista, a new "bunny" emoticon, and integration with Windows Live OneCare Family Safety. Beginning with this version, updates could be downloaded and installed through Microsoft Update. The second beta of Windows Live Messenger 8.5, Beta 2, was released on September 5, 2007. Several issues were fixed in Beta 2, but no significant changes were applied. Compared with the first beta, the build does not say "Beta" on the top of the window, although developers had noted that it was not the final release. The new Windows Live Installer, which is used to install Windows Live Messenger 8.5 Beta 2, does not run on Windows Server 2003. The final release of Windows Live Messenger version 8.5 was released on November 6, 2007, and it introduced no major changes. Windows Live Messenger 2009 was originally designated version 9.0, it was later assigned the technical version number 14.0, in order to be unified with the other Windows Live programs and Microsoft Office programs. In a presentation to the Georgia Institute of Technology's IEEE Student Branch, Microsoft employee Andrew Jenks reported that the Messenger team had been working on multi-person audio/video chat, and they are also attempting to create interoperability with AIM/XMPP/ICQ. There is a basic internal version that works with XMPP already. However, these features were not seen in any versions of Windows Live Messenger 2009. Microsoft sent an invitation to participate in the Windows Live Messenger "9" beta program to Microsoft Connect members on November 20, 2007; a week later, Microsoft began sending out emails welcoming them to the Windows Live Messenger "9" beta program for the first release, known as Beta 0. A fan site for Windows Live Messenger, Mess.be, claimed to have a new build of Windows Live Messenger "9" on August 11, 2008, and published screenshots along with a brief summary of new features. The screenshots featured a new user interface design matching the "Wave 3" design in development by Microsoft. The images were later removed by the site after a DMCA notice was received. The installer for the same build was leaked through private forums on August 23, 2008. It would later be discovered this build was a preview of Milestone 2, or M2. News web site LiveSide published an article on September 4, 2008, with screenshots of M2 of the newly minted "Windows Live Messenger 2009," which had become version 14.0 instead of 9.0 as previously expected. LiveSide summarized its new features, including protection against messaging spam, the ability to stay signed into the application from several computers (referred to as "Multiple Points of Presence Support"), animated GIF files in the photo area, per-contact customized sounds for various user actions, and clickable URLs in the status area. Microsoft began the official beta program for Windows Live Messenger 2009 on September 17, 2008, when it released a new beta officially known as Windows Live Messenger 2009 Beta (Milestone 3, Build 14.0.5027.908), which was made available to the general public as a free download. The ability to submit feedback, however, was restricted to select participants of the Microsoft Connect closed beta program. Notable changes in Milestone 3 include a new revamped and refined user interface to follow suit with the rest of the Windows Live "Wave 3" design, the ability to set a "Scene" by customizing the background image and color of the contact list, and the display of these scenes in conversation windows for improved contact identification and window management. Milestone 3 also brings a new "Groups" feature that allows users to create a continuous group conversation between select contacts, newly redesigned status icons which now resemble small gems rather than the previous "Messenger Buddy" icons, a new default "Favorites" category in which you can place your favorite contacts for easy access to them, a new Photo Sharing utility that allows contacts to quickly and easily browse photos together, and a "What's New" section at the bottom of the contact list to outline recent contact updates. Display pictures have been moved over to the left side of conversation windows, and new colorful borders appear around display pictures to display the current status of that contact. Milestone 3 is the first version of Windows Live Messenger to use the standard window frame on Windows Vista in accordance with the user experience guidelines. Several features were removed in version 9.0 however, such as the ability to use add-ins, the ability to transfer files when the recipient is signed in as offline, the "Be right back," "Out to lunch," and "In a call" status options, the Go to my space button, the ability to adjust webcam settings during a video call, the Send button, some games (depending on your localization) and integration with Windows Contacts. Other features were replaced, such as Sharing Folders (replaced by integration with Windows Live SkyDrive) and background sharing (replaced by the "Scene" feature). On December 15, 2008, Windows Live Messenger 2009 RC (Build 14.0.8050.1202) was released together with the other Windows Live Wave 3 software applications, now renamed as Windows Live Essentials. This version saw a removal of the custom sign-in sound feature however it is still possible to select a sound for other individuals, as well as changes to how the background image chosen is applied to the conversation windows. This build also included over 200 bug fixes including the "Custom Emoticon Bug" and saving of pictures when using the Photo sharing feature. On January 7, 2009, the same build was released as the final version of Windows Live Messenger 2009. The last QFE update for Wave 3 was released on May 12, 2010, and saw the removal of some features from Windows Live Messenger. Specifically, the ability to independently show only your own webcam or your contacts' webcam (one way webcam) and without an audio call is gone. It is only possible to start a video call which starts the webcams of both people communicating and which also automatically starts audio calling. Also removed is the ability to import and save/export instant messaging contacts to and from .CTT files. On June 14, 2012, Microsoft has made the update from 2009 to 2011 mandatory for those using Windows Vista or 7. 2009 continues to be usable for those still running XP. This can be circumvented by running Windows Live Messenger in Windows XP compatibility mode, thus making it believe it is running on Windows XP. In late March 2010, a beta of Windows Live Essentials Wave 4 was leaked onto the internet and has since spread to various BitTorrent networks, which included a private beta build of Windows Live Messenger Wave 4. However, as the software was designed for private beta testing, non-beta testers cannot sign into this leaked build. The new software features a revamped interface which brings the "What's new" section of Windows Live to the new "social pane", similar to the way a social networking site presents updates. Among the new features are tabbed conversations, a redesign of the old emoticons, integration of Bing results, built-in video message support, HD video chat, in-line commenting of social updates, a new social photo viewer that supports commenting (for Facebook and SkyDrive photos), badges support, synchronised status updates, availability by categories, as well as integration with Facebook chat. However, several features had also been removed from the previous version, such as the removal of display names, handwriting tool, one-way webcam requests and import/export of instant messaging contacts feature. The "Wave 4" release of Windows Live Essentials, which includes Messenger, also dropped compatibility with Windows XP and only runs on Windows Vista or Windows 7. The new Windows Live Messenger for the iOS became available on the App Store on June 21, 2010, in addition to other mobile versions of Windows Live Messenger for Windows Phone, BlackBerry, and Symbian mobile platforms. On June 24, 2010, a public beta of Windows Live Messenger Wave 4 was released as part of the new Windows Live Essentials beta. A "beta refresh" of Windows Live Messenger Wave 4 was released on August 17, 2010, as part of an upgraded Windows Live Essentials beta. The final version of Windows Live Messenger 2011 (Wave 4) was released on September 30, 2010. On the same date, a version of Windows Live Messenger for Zune HD also became available. On August 7, 2012, Microsoft delivered a new version of the Windows Essentials 2012 suite, which includes Windows Live Messenger 2012. On November 6, 2012, Microsoft announced that Messenger and Skype services would merge in the first quarter of 2013. According to Tony Bates (president of Skype Division at the time), Messenger users could sign into Skype using their Microsoft accounts, access their Messenger contacts and communicate as usual. On January 8, 2013, Microsoft emailed Messenger users and informed them that with the exception of mainland China, the Messenger service would stop working on March 15, 2013, and users would not be able to sign in. On February 15, 2013, ZDNet wrote the discontinuation email was only sent to one percent of Messenger users, a test group. On the same day, Microsoft announced its plans to phase out Messenger: The process would start on April 8, 2013, with English users and would end on April 30, 2013; Messenger would remain available in mainland China. According to ZDNet, this might only apply to the ability to sign in with Messenger client; Microsoft would keep its Messenger service running for another year. "Windows Live Messenger Upgrades to Skype," as they were referred to by Microsoft, started on April 8, 2013. This transition took place language by language. Brazil was the last country to be "upgraded," on April 30. Chinese Messenger users received mail from Microsoft in August 2014, containing an announcement that Messenger service in China would end on October 31, 2014; users were advised to migrate to Skype and receive free credits. Windows Live Messenger's album viewer is based on Windows Photo Gallery and provides users a photo viewing experience for photo albums shared via SkyDrive and Facebook. The album viewer is interactive and supports full screen and slideshow modes, as well as viewing and uploading comments on Facebook and SkyDrive albums. It also supports people tagging for SkyDrive. The album viewer closely resembles the Microsoft Silverlight counterpart for web photo albums present on SkyDrive. Windows Live Messenger allow users to appear offline to particular individual contacts, as well as to an entire category within Windows Live Messenger, while appearing online to other contacts. This is a recent feature of Windows Live Messenger 2011, and is a departure from the previous versions of Windows Live Messenger, where blocking a contact would prevent the "blockee" from sending the user any messages to the "blocker". With the "appear offline to" configuration currently implemented, "hidden from" users can still send "offline messages" to the target. Users can connect services such as Facebook, MySpace and LinkedIn using Windows Live Profile, and display their contact's Messenger social updates within the "Full view" of Windows Live Messenger. Users can also post status updates and photos directly to the connected services within Windows Live Messenger. Additionally, Messenger also imports all contacts from the connected services and integrates with Facebook Chat (via the XMPP protocol) for instant messaging support with users on Facebook. One can send messages to contacts who are offline; they will receive the messages once they come online. Additionally, a user can start conversations even when his or her status is set to Appear Offline in Windows Live Messenger 2009 or before. There are various games and applications available in Windows Live Messenger that can be accessed via the conversation window by clicking on the games icon, and challenging your friend or contact to a competition in a game, or inviting them to launch a shared external application. Windows Live Messenger Companion was made available as part of Windows Live Essentials 2011. However, Microsoft discontinued Messenger Companion in its newer Windows Essentials 2012 suite. Windows Live Messenger used the Microsoft Notification Protocol (MSNP) over TCP (and optionally over HTTP to deal with proxies) to connect to Microsoft Messenger service—a service offered on port 1863 of "messenger.hotmail.com." The protocol is not completely secret; Microsoft disclosed version 2 (MSNP2) to developers in 1999 in an Internet Draft, but never released versions 8 or higher to the public. The Messenger service servers currently only accept protocol versions from 8 and higher, so the syntax of new commands sent from versions 8 and higher is only known by using packet sniffers like Wireshark. This has been an easy task because – in comparison to many other modern instant messaging protocols, such as XMPP – the Microsoft Notification Protocol does not provide any encryption and everything can be captured easily using packet sniffers. The lack of proper encryption also makes wiretapping friend lists and personal conversations a trivial task, especially in unencrypted public Wi-Fi networks. The content of users' messages is filtered on server side of the client. For example, the user can't send the links to The Pirate Bay's pages neither from the Windows Live Messenger, nor through other clients supporting the protocol. However, links to other P2P networks are allowed. 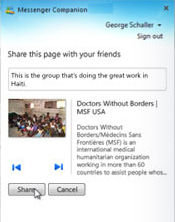 The i’m initiative was a program Microsoft launched in March 2007, that connects the user with ten organizations dedicated to social causes through Windows Live Messenger, only for conversations sent or received in the USA. Every time someone had a conversation using i’m, Microsoft Corp. shared a portion of the program's advertising revenue with the organization of the user's choice. There was no set cap on the amount donated to each organization. The more i’m conversations the user had, the more money went to one of the ten causes. Each participating organization was guaranteed a minimum donation of $100,000 during the first year of the program. The i’m initiative worked with version 8.1 and above. In March 2010, the initiative concluded, having raised over 3 million dollars. Messenger Mobile (formerly named Windows Live Messenger Mobile) is the version of Messenger that is aimed to be used in mobile devices over a cellular data plan or Wi-Fi (if supported by the phone). There is a WAP-compatible version that may be used on any mobile device, and also specific client versions designed for Windows Mobile, iOS, BlackBerry and Nokia Series 60 devices. A client version of Windows Live Messenger Mobile is a part of client application named "Windows Live for Windows Mobile" included with the Windows Mobile 6 operating system. It is included on both Windows Mobile 6 smartphone edition (non-touch screen phones) and professional (touch screen phones). Among other features you can send voice-clips (max 10 seconds), pictures & emoticons. Windows Live Messenger support was included in the Xbox 360 spring 2007 dashboard update released on May 9, 2007. It was known as Xbox Live Messenger. Those using Windows Live Messenger are able to see the Gamertags of friends logged into Xbox Live, including the games they are playing. Xbox 360 users can chat in-game (or while watching a movie). Although only text chat is supported, Microsoft has suggested that voice and video chatting may come in a future update. Support for child accounts was added in December 2007. To coincide with the arrival of the integration of Windows Live Messenger with Xbox Live, Microsoft released a new Xbox 360 keyboard adapter called the Xbox 360 Messenger Kit for easier text input. The keyboard device attaches to the standard Xbox 360 controller through the headphone jack and features a QWERTY-style key layout with 47 backlit keys. However, any USB keyboard is also compatible with the Xbox 360. Microsoft also announced on June 14, 2010 that users on Xbox LIVE with the controller-free Kinect will be able to have real-time video conversations with Windows Live Messenger contacts. This feature was enabled at launch. Microsoft Messenger for Mac (previously MSN Messenger for Mac) was the official Mac OS X instant messaging client for use with Microsoft Messenger service, developed by the Macintosh Business Unit, a division of Microsoft. Its feature list was limited in comparison to that of its counterpart Windows Live Messenger; the client lacked a number of features that its Windows counterpart contained. The versions 3.x and later of Microsoft Messenger for Mac featured new Aqua graphics, whereas version 2.x and below have graphics similar to Windows Messenger 4.0. Versions 5.x used the brushed metal theme. Version 2.5.1, update to version 2.5, which is a mandatory update to version 2.1 that is available for users running Mac OS 9.2.2. Version 7.0.0 for Mac OS X 10.4.9 or newer was released on April 29, 2008. Version 7.0.1 for Mac OS X 10.4 or later includes minor bug fixes. Version 7.0.2 for Mac OS X 10.4 or later: improves overall quality and conversations with Microsoft Office Communicator 2007 R2. Version 8.0.0 beta for Mac OS X 10.5 or later, for Intel Macs only: Official Beta released on March, 24th 2010. Adds A/V conferencing between Mac OS X users and Windows Live Messenger 2009 users. Version 8.0.0 for Mac OS X 10.5 or later, for Intel Macs only: Released with Microsoft Office 2011 for Mac in October 2010 and bears a visual similarity to previous Windows counterparts. It features somewhat more stable functional voice and video calls. With the release of Microsoft Messenger for Mac 7.0, Microsoft has discontinued the client's support for older versions of their Corporate messaging systems (such as Live Communications Server 2005). The latest version to support these older systems is Version 6.0.3, which is still available for download on the Microsoft website. Webcam and audio support was delayed due to Windows Live Messenger's webcam and audio engine being reworked, which meant that the Mac version had to wait until this was complete in order for both platform releases to function correctly. The Windows Live Messenger for iOS client supports receiving of instant messaging notifications even when the application closed, and allows Multiple Points of Presence (MPOP) such that a user can be signed into multiple locations at the same time. Photos and albums can also be uploaded from the mobile devices onto Windows Live Photos, based on SkyDrive, and the application allows simple image editing capabilities and people tagging within the photos. The application also supports the "Messenger social" feed on Windows Live Profile, allowing users to view and comment on the social updates and activities of their contacts on Windows Live, as well as those on Facebook, MySpace and LinkedIn once these social networks have been connected to Windows Live as a "Service". The Windows Live Messenger Mobile client comes as a Java ME mobile application pre-loaded on devices such as Nokia 7610, Nokia 7510, Nokia 7210, Nokia 6700c, Nokia 6600s, Nokia 6303c, Nokia 6260s, Nokia 5220, Nokia 5130XM, Nokia 3720c, Nokia 3710f, Nokia, 3600s, Nokia 2730c, Nokia 2700c, Nokia 5530, Nokia 6303c and Nokia X3. Windows Live Messenger Mobile client is also pre-loaded on most Sony Ericsson mobile devices as a Java ME application. Windows Live Messenger running on an S60 Platform device. A client for Windows Live Messenger was developed by Microsoft for the Symbian S60 Platform commonly used in mobile phones such as Nokia smartphones and released on August 23, 2007, to selected markets. In May 2009, the client was made available on the Ovi Store. This version of Windows Live Messenger includes many of the features of the Windows Live Messenger client, including grouped contacts, voice clips (max 10 seconds), image and file sending; as well as features unique to S60 such as tabbed chat windows and integration with contact list and other features of the S60 platform. When the trial expires the cost to users of Messenger for S60 is £1.50/$2.94 for 30 calendar days of use. As of February 2009, Microsoft stopped charging for Windows Live Mobile and the service is now offered for free. On October 13, 2005, Yahoo! and Microsoft announced plans to add interoperability between their messenger services. The announcement came after years of third-party interoperability success (most notably, PowWow by Tribal Voice, Trillian, Pidgin) and criticisms from Tribal Voice and iCast that the major real time communications services were locking their networks. Yahoo! and Windows Live Messenger became interoperable on July 12, 2006. For six years, Yahoo! Messenger and Windows Live Messenger users in possession of up-to-date software could communicate across the two networks. Instant messaging as well as transmission of emoticons, nudges, offline messages, presence information and personal status messages were supported. On December 14, 2012, the interoperability ended. Interoperability with Facebook Chat was added on September 30, 2010 with the launch of Windows Live Messenger 2011. ^ "Microsoft Launches MSN Messenger Service". News Center. Redmond, Washington: Microsoft. July 21, 1999. ^ a b c d e f g h i j "Lists: Releases". Inside Windows Live Messenger. Microsoft. Archived from the original on February 23, 2008. ^ "Metro inspired Windows Live Messenger caught on Video". 1800PocketPC. October 3, 2010. Archived from the original on September 6, 2011. ^ Majid, Akbar (June 29, 2009). RIP: MSN Web Messenger, July 22, 1999 – June 30, 2009. merinews.com. ^ "AOL blocks Microsoft Net messaging". CNET News.com. ^ "Callserve registers over a half million Microsoft Messenger users". m2.com. ^ Crouch, Cameron (July 20, 2000). MSN gives Messenger a voice. Networkworld.com. ^ Keizer, Gregg (February 26, 2002). Instant Messaging Road-Test – Messenger 4.6. ZDNet. ^ Wilcox, Joe (September 25, 2002). Microsoft puts a price on IM features. CNET Networks. ^ Flickinger, Derek R. (July 2003). Windows XP interactions with UPnP-based IDGs version 1.0. Home Toys. ^ "Patching". Microsoft Developer Network. ^ Windows Live Messenger 8.0 Beta 2 blog entry. Messengersays.spaces.live.com (February 27, 2006). Retrieved on April 20, 2012. ^ Windows Live Messenger 8.0 Beta 3 blog entry. Messengersays.spaces.live.com (May 2, 2006). Retrieved on April 20, 2012. ^ Windows Live Messenger 8.0 Final release blog entry. Messengersays.spaces.live.com (June 19, 2006). Retrieved on April 20, 2012. ^ Windows Live Messenger 8.0 Final Refresh blog entry. Messengersays.spaces.live.com (August 10, 2006). Retrieved on April 20, 2012. ^ Windows Live Messenger 8.1 Beta 1 blog entry. Messengersays.spaces.live.com (October 30, 2006). Retrieved on April 20, 2012. ^ Windows Live Messenger 8.1 Beta Refresh blog entry. Messengersays.spaces.live.com (December 13, 2006). Retrieved on April 20, 2012. ^ Windows Live Messenger 8.1 Final blog entry. Messengersays.spaces.live.com (January 29, 2007). Retrieved on April 20, 2012. ^ a b Windows Live Messenger blog: Upgrading to 8.1. Messengersays.spaces.live.com (September 12, 2007). Retrieved on April 20, 2012. ^ Windows Live Messenger 8.5 Beta 1 blog entry. Messengersays.spaces.live.com (May 30, 2007). Retrieved on April 20, 2012. ^ Details about the bunny emoticon at the Windows Live Messenger blog. Messengersays.spaces.live.com (May 30, 2007). Retrieved on April 20, 2012. ^ Windows Live Messenger 8.5 beta available from. LiveSide.net (May 30, 2007). Retrieved on April 20, 2012. ^ Windows Live Messenger 8.5 Beta 2 blog entry. Messengersays.spaces.live.com (September 5, 2007). Retrieved on April 20, 2012. ^ Official Windows Live Messenger team blog: Announcing Windows Live Messenger 8.5!. Messengersays.spaces.live.com (November 6, 2007). Retrieved on April 20, 2012. ^ "Messenger 9, GTalk integration, Messenger API, new client for Mac OS X - news unveiled at Georgia Tech presentation (whew)". Liveside.net. October 31, 2007. Archived from the original on November 1, 2007. Retrieved April 20, 2012. ^ News post at Mess.be of exclusive 9.0 build. Mess.be. Retrieved on April 20, 2012. ^ Jeremy Kirk. "Microsoft to clamp down on spam over IM". IDG News. Retrieved November 24, 2007. ^ Get back the statuses which were removed from WLM 2009. Msghelp.net (January 13, 2009). Retrieved on April 20, 2012. ^ Unable to send typed messages – no send button. Vistax64.com (December 29, 2008). Retrieved on April 20, 2012. ^ Where has the "encrypt contact list data" option gone?. Vistax64.com. Retrieved on April 20, 2012. ^ Windows Live Messenger 9.0, No Sharing Folders?. Aeroxp.org. Retrieved on April 20, 2012. ^ Refreshing the Windows Live Essentials beta. Windowslivewire.spaces.live.com (December 15, 2008). Retrieved on April 20, 2012. ^ Windows Live Essentials is ready to download. Windowslivewire.spaces.live.com (January 7, 2009). Retrieved on April 20, 2012. ^ Messenger 2009 QFE3 update removes Webcam feature and the I’m (*help) emoticon. Messengergeek.spaces.live.com. Retrieved on April 20, 2012. ^ Save/import of contacts also gone in latest QFE3 update of Messenger 2009. Messengergeek.spaces.live.com. Retrieved on April 20, 2012. ^ R., Rudi (June 15, 2012). "Mandatory Update to Windows Live Essentials is now available". Microsoft Community. Microsoft. Retrieved April 22, 2012. ^ "How to Disable Windows Live Messenger 2009 Force to Update". Web Talk. January 25, 2011. Retrieved April 22, 2013. ^ Rosa Golijan (April 27, 2010). "Windows Live Messenger iPhone App Almost Looks Better Than Desktop Version". Gizmodo. Retrieved April 26, 2010. ^ "Windows Live Preview Messenger Download". Microsoft. June 24, 2010. Retrieved June 24, 2010. ^ Jones, Chris (August 17, 2010). "Windows Live Essentials 2011 beta refresh". Microsoft. Retrieved August 17, 2010. ^ Jones, Chris (September 30, 2010). "Windows Live Essentials 2011 available for download now". Retrieved February 15, 2011. ^ LeBlanc, Brandon (October 1, 2010). "Windows Live Messenger for the Zune HD". Blogging Windows. Microsoft. Retrieved August 31, 2014. ^ Warren, Tom (October 1, 2010). "Windows Live Messenger for Zune HD released". Neowin. Retrieved August 31, 2014. ^ "Windows Essentials 2012 released, comes with new Movie Maker and Photo Gallery". WinBeta. August 7, 2012. ^ Serea, Razvan (August 8, 2012). "Windows Essentials 2012 (16.4.3503.0728) released". Neowin. Retrieved August 31, 2014. ^ Wilhelm, Alex (November 6, 2012). "Confirmed: Microsoft to retire its Messenger IM service in Q1 2013, moving 100M+ users to Skype in single act". The Next Web. Retrieved April 13, 2013. ^ Bates, Tony (November 6, 2012). "Talk to your Messenger Contacts on Skype". Skype Blog. Microsoft. Retrieved April 13, 2013. ^ Protalinski, Emil (January 9, 2013). "Microsoft confirms Messenger will be retired and users migrated to Skype on March 15". The Next Web. Retrieved April 13, 2013. ^ a b Foley, Mary Jo (April 1, 2013). "Countdown clock: Microsoft marches toward its Messenger phase-out". ZDNet. CBS Interactive. Retrieved April 13, 2013. ^ Munsell, Parri (February 15, 2013). "Skype and Messenger Coming Together: The Next Chapter". Skype Blog. Microsoft. Retrieved April 13, 2013. ^ "MSN Messenger Is Shutting Down In Oct, 31". TechieSmith. August 31, 2014. Retrieved August 31, 2014. ^ Xiang, Tracey (August 29, 2014). "The Once-beloved Microsoft Messenger to Finally Shut Down in Mainland China". TechNode. Retrieved August 29, 2014. ^ "Microsoft announces they're retiring Messenger applications, but what does that mean?". Jonathan Kay, MessengerGeek. November 7, 2012. Retrieved June 24, 2018. ^ "End of week one: Messenger still not blocked". Jonathan Kay, MessengerGeek. April 16, 2013. Retrieved June 24, 2018. ^ Kay, Jonathan (April 23, 2013). "Use Messenger Reviver 2 to bring back Messenger and beat Skype". MessengerGeek blog. Retrieved June 24, 2018. ^ Kay, Jonathan (May 20, 2017). "Messenger Reviver 2 Discontinued". MessengerGeek blog. Retrieved August 9, 2018. ^ "Escargot MSN Server". escargot.log1p.xyz. Retrieved January 17, 2019. ^ What's New in Messenger: Windows Live Reviewer's Guide. Windowslivepreview.com. Retrieved on April 20, 2012. ^ draft-movva-msn-messenger-protocol-00 – MSN Messenger Service 1.0 Protocol. Tools.ietf.org (August 31, 1999). Retrieved on April 20, 2012. ^ Van Der Sar, Ernesto (March 24, 2012). "Microsoft Censors Pirate Bay Links in Windows Live Messenger". TorrentFreak. Retrieved April 1, 2012. Whatever Microsoft’s reason for monitoring private conversations and then swallowing Pirate Bay links, the Redmond-based company’s censorship policies are not very consistent. All of the other large BitTorrent sites remain unaffected, even though they offer content that’s identical to The Pirate Bay. ^ "i'm MAKING A DIFFERENCE". Windows Live website. Microsoft Corporation. June 14, 2010. Retrieved June 15, 2010. ^ News on Spring 2007 Update from Xbox.com. ^ Support page from Xbox.com. Retrieved on December 16, 2009. ^ "Sony Ericsson support website: Windows Live Messenger". Sonyericsson.com. Retrieved March 19, 2012. ^ "Nokia Europe - Windows Live". Europe.nokia.com. Retrieved March 19, 2012. ^ Metz, Cade (January 9, 2008). "Microsoft set to milk mobile Messenger mavens?". The Register. Retrieved March 19, 2012. ^ "Nokia Europe - Frequently asked questions about Windows Live". Europe.nokia.com. Retrieved March 19, 2012. ^ Hansen, Evan (December 10, 1999). "AOL, Tribal Voice exchange messaging blows". CNet.com. Retrieved August 6, 2011. ^ Hu, Jim (December 4, 2000). "AOL rival drops instant messaging service". CNet.com. Retrieved August 6, 2011. ^ Hu, Jim (April 25, 2000). "AOL instant messaging rivals file complaint with FCC". Cnet.com. Retrieved August 6, 2011. ^ Yahoo Interoperability Arrives. Bigblueball.com. Retrieved on April 20, 2012. ^ Microsoft Press Release: Yahoo! and Microsoft Bridge Global Instant Messaging Communities. Microsoft.com. Retrieved on April 20, 2012. ^ Talk to your Yahoo! friends from Windows Live Messenger. Inside Windows Live Messenger. Microsoft. Retrieved on December 20, 2012. ^ MSN Messenger interoperability discontinuing on December 14. Yahoo.com. Retrieved on December 17, 2012.